If you’re a dog owner I bet there’s a strong possibility that you’re going to give your pup a gift this holiday season. 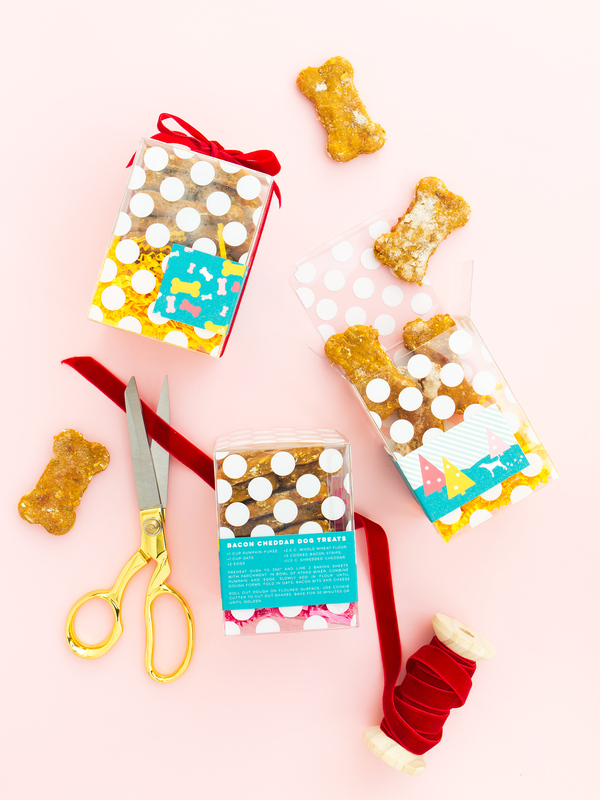 So in the spirit of all things DIY, today I’m sharing the perfect gift for your favorite furry friend! 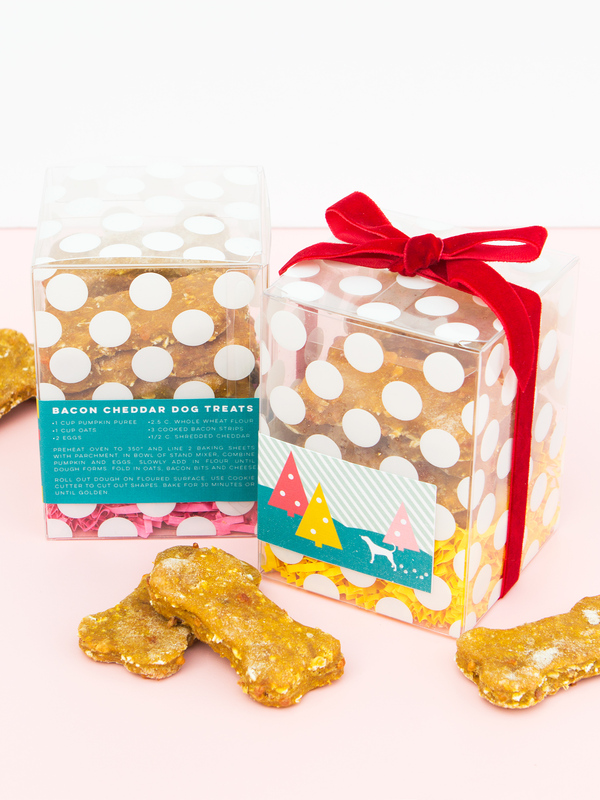 It’s a batch of homemade bacon cheddar biscuits packaged in an oh-so-cute way that you might just want to eat them more than your dog. These bake up a pretty large batch, so you can gift them to all the neighborhood dogs or bring them along to a holiday party. 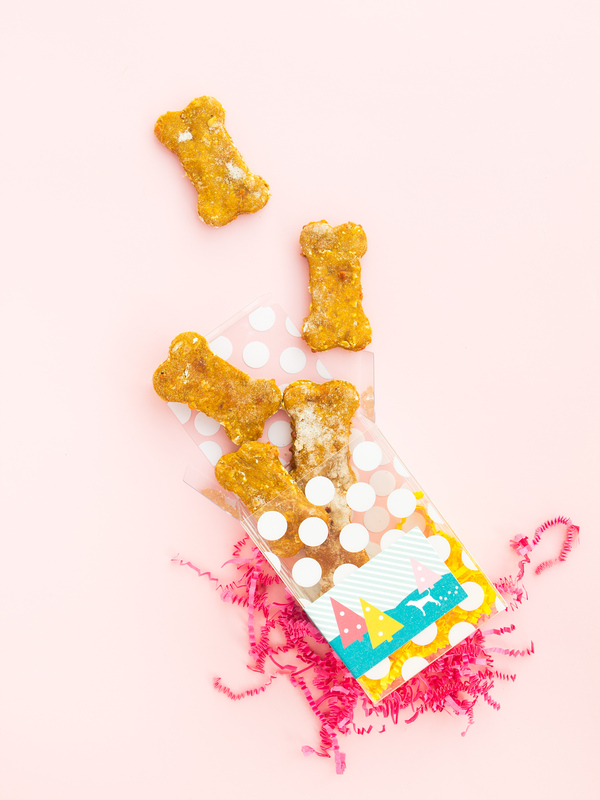 Because any dog loving host will appreciate a thoughtful gift for their pup! 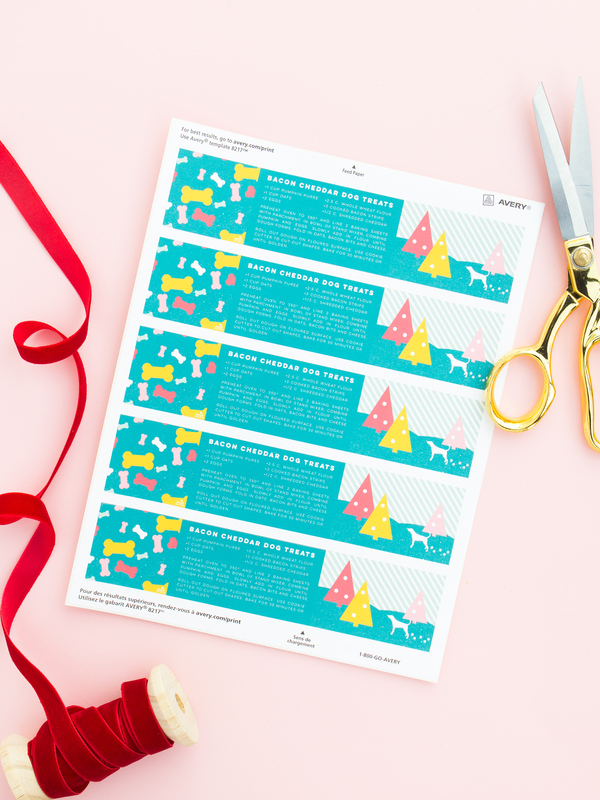 While the treats are in the oven, you can download the printable files and print out the wraparound labels on Avery label paper. The design includes the recipe so your friend can make a batch too. 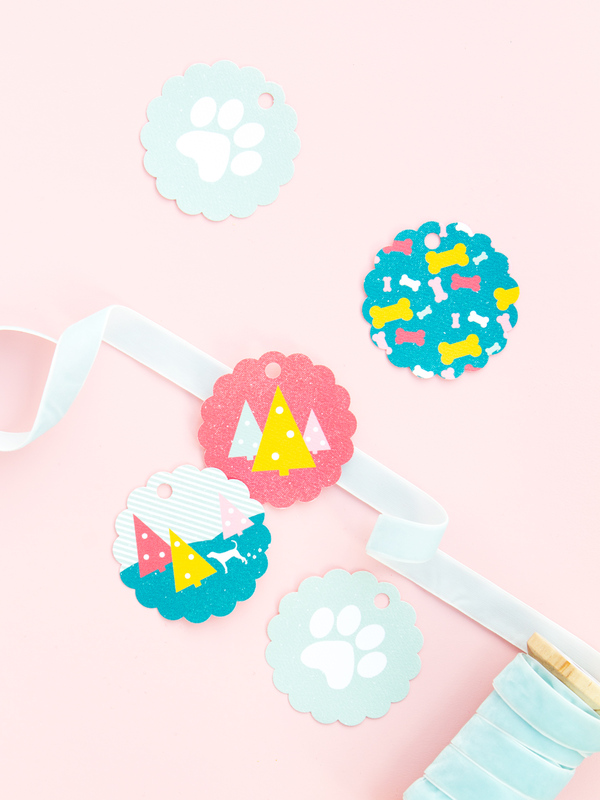 I’ve also created coordinating round hang tags that are perfect for all your dog-related gifting. Preheat the oven to 350° and line 2 baking sheets with parchment (or use a Silpat sheet). In the bowl of a stand mixer, combine pumpkin and eggs. Slowly add in the flour until dough forms. Fold in the oats, bacon and cheese. Roll out the dough onto a floured surface. Use cookie cutter to cut out biscuits. Kneed the scraps and re-roll to use up all the dough. Bake for 30 minute or until golden brown and firm. Allow them to cool completely. Download the printable wraparound label. Go to Avery Design & Print Online and search for the 8217 template. Upload the label design and adjust the sizing so it completely fills the label space. Select the number of labels you want to print and click print! Note: I recommend only printing one label first to check the alignment. If it’s not aligned perfectly, you can adjust the alignment in the preview and print option window. 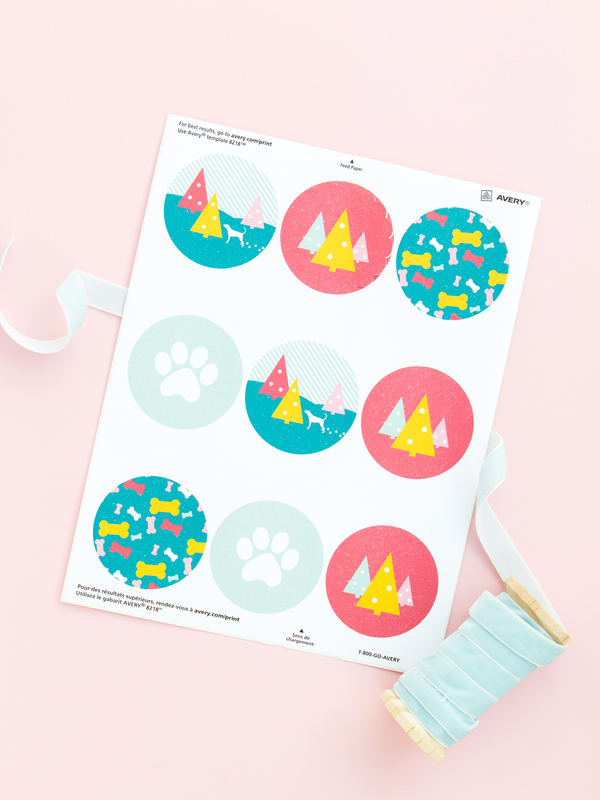 Create coordinating gift tags using Avery 80503 scallop round tags and make stickers Avery 8218 scallop round labels. Perfect for decorating gifts for pups and their owners! Looking for more gift ideas for dogs and their owners? Check out my dog gift guide! Clearly the take home from this is that I need a dog. Seriously though these are adorable!